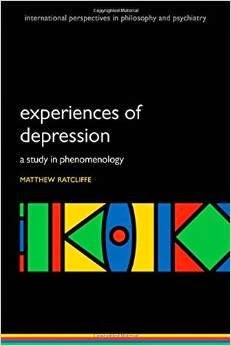 In this post, Matthew Ratcliffe, Professor of Philosophy at Durham University, presents his new book, Experiences of Depression. From 1st April 2015, Matthew will be Professor for Theoretical Philosophy at the University of Vienna, Austria. My new book, Experiences of Depression: A Study in Phenomenology (Oxford University Press, 2015), is part of a wider-ranging, longer-term research project on the phenomenology of feeling in psychiatric illness. The book is a philosophical exploration of what it is like to be depressed. I start from the observation that many people struggle to describe their experiences of depression. It is often remarked that depression is like being in a ‘different world’, an isolated, suffocating, alien realm that is difficult or impossible to convey to others. By drawing on work in phenomenology, philosophy of mind and several other disciplines, I offer a detailed account of what such experiences consist of, which focuses on themes such as bodily feeling, emotion, narrative, belief, agency, temporal experience and interpersonal relations. A consistent theme throughout the book is the experience of possibility. I argue that all of our experiences and thoughts are imbued with a sense of the possible, and that the ‘world of depression’ can be understood in terms of the kinds of possibility that a person is able to experience and contemplate. Although I emphasise the heterogeneity of depression, I maintain that the vast majority of experiences associated with diagnoses such as ‘major depressive disorder’ involve the loss, diminution or increased salience of certain kinds of possibility. Various seemingly disparate symptoms, such as bodily feelings, characteristic beliefs, alterations in the sense of time, and an inability to connect with other people are to be construed as inextricable aspects of a unitary shift in one’s sense of the possible. The practical significance of things is usually diminished; they no longer offer up the usual possibilities for activity. Along with with this, there may be a sense of impossibility. For example, other people might continue to offer possibilities for communion but these possibilities present themselves as ‘impossible for me to take up’. Estrangement from other people and from the world in general amounts to a change in the sense of reality and belonging - things no longer appear available; they are strangely distant, not quite ‘there’ anymore. Certain kinds of possibility may also be heightened. A world that ceases to offer the invitation to act can at the same time take the form of an all-enveloping threat, before which one is passive, helpless and alone. Hope, practical significance and interpersonal connection are not just gone. Their loss is very much part of the experience; it is felt. And I offer an account of how our sense of the possible is, at the same time, a kind of bodily feeling. Hence the book demonstrates how phenomenological research can contribute to psychiatry, by facilitating a better understanding of patients’ experiences and, in so doing, informing classification, diagnosis and treatment. In addition, I show how the study of depression experiences can contribute to philosophical debates concerning a wide range of topics, including the structure of intersubjectivity, the nature of empathy, our sense of free will, temporal experience, the ingredients of emotion and feeling, what it is to believe something, and what it is to hope. The book also describes and puts into practice a method for doing phenomenological research. I maintain that we can make phenomenological discoveries, of a kind that have broader applicability, by engaging with experiences of depression. From the perspective of the phenomenologist, this book is not so much a study of depression as a wider-ranging analysis of the changeable space of possibilities that we inhabit. "Stumbled" on this while preparing for a meetup to discuss Paul Pruyser's "Phenomenology and Dynamics of Hoping". I have family members who are depressed and seeking Christian (Baptist/Methodist) pastoral care/counseling near Birmingham, Alabama.